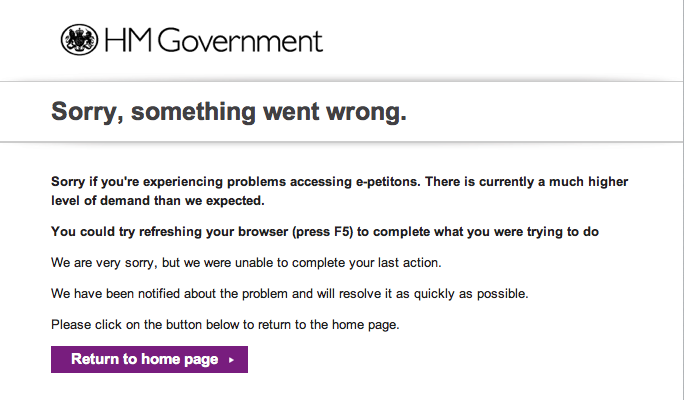 It’s a week since the Government launched its e-petition website, so what have we learnt from the first 7 days? Update 12/8 – 1,806 petitions have been added in the sites first week, of those 152 have gained only 1 signature and only 28 have gained more the 1,000. 1 – The site can’t cope with surges in traffic. It was perhaps to be expected that the site would go down on the first day, indeed it’s almost a tradition for new government sites which have all failed to anticipate the number of people visiting. But it’s also been down for much of today (Wednesday) as people have surged to sign a petition to remove benefits from those convicted of rioting in London which has gained over 79,000 signatures very quickly. I’d be concerned that the site wouldn’t be able to cope if an organisation with big mailing list asked its supporters to take action by signing a petition. One of the most disappointing aspect of the site is the homepage, which list the petitions by most recent one put up as a default option and provides two other options which allow you to sort by title and number of signatures. The search function is satisfactory, and they’re also listed by department but it would have been nice to see other ways of finding petitions, and perhaps details of the latest, most signed and most signed in the last 24 hours detailed on the home page. 4 – It’s social media that’s driving traffic to the site. Last Thursday was a great case study for this. The petition to bring back capital punishment, which had been championed by blogger Guido Fawkes was heavily trailed in the newspaper and TV but by the end of the day it’d only got 3,000 signatures. Contrast that to a counter petition to retain the ban on capital punishment which was promoted almost exclusively on twitter until Newsnight covered it which got 6,000 in the first day. A week later it’s still well ahead of the supposedly ‘higher profile’ petition. Similarly, it looks like much of the traffic to the London rioting petition has come from Facebook/Twitter as the media hasn’t been interested in covering it, bit.ly suggests that its been shared over 65,000 times on Facebook. 5 – Those behind it are more agile than expected. I wrote last week that one of my concerns was that it’d take 7 days for petitions to be approved, which would make it hard for petitions to capitalise on what’s happening in the media. Given that the first report of recent events in London came through on Saturday night, the London rioting petition shows that it’s possible for those working on it to turn around petitions quicker than that. 6 – I’m already a little bored of it. As I write the top petitions are on very similar subjects to those that were around on the No10 petition site, it’s almost predictable and as yet it doesn’t seem to have generated any interesting new ideas for Parliament to debate. This is perhaps in part down to the format that requires any petition to get over the 100,000 signature threshold, which means many campaigns will feel that they can’t make target but also the lack of flexibility in the system. I’m expecting some media coverage of the first petition that makes it over the 100,000 line and the first to be debated, but after that I’m not sure how much interest its going to generate. What are your thoughts or reflections from the first week of the e-petition site? It needs a spell check function on the submission form. HI Tom, I’d really like to hear your thoughts on the process of when the first one past 100k happens. Right now, I’m assuming this will be the riots/benefits one. Wondering how they actually take it from petition to debate and the steps within in it (in practice rather than the theory of what they’ve said). On the traffic point, I wonder if they built it light to get a sense of how it stacks up. I’d have thought they could scale the load fairly easily with government tech levels. If it does stay flakey, suggest orgs think about staggering petition requests (easier said than done in a viral world). Thanks again for another interesting blog. I’m guessing nothing will happen until Parliament returns in September and then it’ll be down to the Backbench Business Committee to decide if they want to give it time to be debated. I imagine it’ll be hard to not provide space for a debate as it’s the first petition to come through the system, but I’m not sure much more will happen beyond that. Clearly one of the challenges of the process is how a petition is turned into something that could become legislative, I guess that would need an MP to put forward a motion or amendment to existing legislation and then it’d be driven by an MP rather than the petition originator and would need more Parliamentary time to go through it’s various readings and I’m unclear where that could come from.